Benjamin Britten's admiration for Mahler went back a long way, long before the Mahler "boom" of the early sixties to before World War Two. In his fascinating liner notes, Donald Mitchell identifies his friend Britten as one of the leading figures in the early renaissance of Mahler's music, a renaissance Mitchell maintains would have started much earlier had it not been for the war. In 1930 the sixteen-year-old Britten had been present at the Queen's Hall in London to hear Henry Wood conduct the Fourth Symphony. Four years later he had been in Vienna to hear the same work under Mengelberg and, in that city, buy the miniature score now preserved at the Britten-Pears Library in Aldeburgh. In 1936 he had listened enthralled to a radio broadcast of Kindertotenlieder and a year later written to a friend of his admiration for Das Lied Von Der Erde. He owned the two sets of 78s preserving Walter's live Vienna performances of that work and the Ninth from 1936 and 1938. A remarkable series of facts when you consider how hard it was to hear Mahler's music in England in the 1930s when his music was regarded largely with either contempt or indifference by all but the most fervent admirers. All this and more makes Britten's interpretations of Mahler something to be savoured. I also believe there is something special about one composer expressing admiration for another through his interpretative skills: surely the ultimate compliment of one colleague to another over and above what ever other insights they may bring. Because, make no mistake, Britten was a fine conductor in his own right and these recordings can be considered alongside any others currently before us. In hospital in 1943 Britten had written to Erwin Stein of "my precious Mahler 4th, which I think I have more genuine affection for than any piece in the world", and in 1961 (whilst at work on the War Requiem) he programmed the work at that Summer's Aldeburgh Festival. 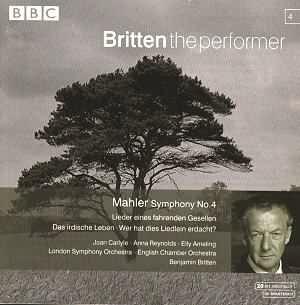 The BBC recording with the LSO in Orford Church makes up the lion's share of this fourth CD in the "Britten As Performer" series from the BBC. Splendidly restored for CD, it has a rich and deep sound with some church reverberation but no distortion to playing which, while not secure at all times, breathes humanity and involvement from a very alert LSO in one of their golden periods. In fact no apologies need to be made for the sound at all which can more than hold its own against all-comers. In 1963 Britten talked about this Aldeburgh performance of two years before to an interviewer when he said: "My experience of conducting the Fourth Symphony at Aldeburgh showed me what a master of form he (Mahler) is, particularly in the first movement of that great work." These thoughts seem to partly explain the decision for his brisk tempo in the first movement which at 15:21 is the fastest I have ever heard. But it may also have something to do with the fact that in recent years tempi in Mahler have become slower as more and more conductors, in my opinion, choose to impose themselves and hang their own (real or trendily imagined) neuroses on music which is more than capable of expressing its own character without the conductor interfering. The effect from the start and throughout is of lightness and optimism, classical tautness rather than romantic weight, and I think this general approach suits the character of the music very well. Fritz Reiner, next fastest at 15:41 and - significantly in the light of my observation regarding slower tempi - recorded three years before Britten, tried for the same effect but with far less warmth. So Britten must be applauded for taking the idea to its logical extreme while, like Rafael Kubelik at 15:48 and recorded in 1969, not compromising the poetry in the music. His lower strings may get caught a little unaware at 21 but they soon become used to what is being asked. In fact one of the sounds one takes away from this recording is the attention Britten pays to articulating the lower strings, helped by the acoustic. With a brisk edge to the tempo any relaxations of pace Mahler asks for do tell, like at 38-46, even though they don't distract from the general sharpness as they sometimes do under other interpreters. At the close of the Exposition there are some lovely string slides, as idiomatic a Mahler sound as you could hope for, and this also applies to the spicy woodwinds at the start of the Development in the passage 102-124 where Britten is careful to inject a more dramatic cloak to the proceedings. The "climax on the dissonance" during 221-228, leading to the premonition of the Fifth Symphony's opening (the "Kleiner Appel"), is well observed but not to the extent that it protrudes and holds up the sense of momentum that the stronger structural/formal approach has brought with it; likewise the passage a little later which Mahler asks to be played "mit grosser ton". It's a delicate balance this "form versus detail" dichotomy, and though Britten clearly veers to the former he seems aware enough of the latter pulling him back since, in the closing section, his ability to bring out delectable points of detail without diminishing the sharp focus shows that a conductor doesn't really need to slow up and "ham up" in order to seduce the ears of the listener. This closing section more than any other in the movement, maybe even in the whole symphony, is a vindication of Britten's approach. I imagine it takes preparation and hard work to bring off but Britten clearly wasn't afraid of that nor, on the basis of what we hear, were Pierre Monteux's LSO. A refreshing end to a refreshing performance of the first movement with much to tell us about this work and the way it might be performed. Mahler once said that the upper limit of a tempo is the point at which individual notes stop being heard. As a composer, Britten must have agreed with this. By not lingering too much over the Trios in the second movement Britten keeps the momentum up here also. I must also draw attention to the deliciously played violin solos which make their out-of-tune effect without appearing to be too ill-mannered (Hugh Maguire, perhaps) and some superb solo horn playing (Barry Tuckwell, surely). The performance of this movement comes out on the side of the angels to come rather than the Devil whose violinist Death ("Friend Hein") dances around us but never really threatens. If freshness and classical rigour seemed the keynote in the first and second movements it's clear Britten reserves the true emotional heartbeat for the third in an interpretation which is one of the finest (maybe even the finest) I have ever heard. Following the first two movements you could be forgiven for expecting something in the same vein but Britten confounds expectations by delivering breadth and lyricism which stand out in even greater relief following what he has done earlier. It's one of those performances that if you know you are going to have to review it you find the notebook you have been keeping for remarks remains blank because you are lost in sheer enjoyment. Listen to the meticulous care for dynamics both in the string parts and the woodwind solos. This is string playing of the highest calibre. Not slick and well-drilled, but unified in its humanity and its adherence to a sung, phrased line. The flinging open of the gates episode (at No.12) is big and powerful, but it's warm also and it sounds perfectly integrated with the rest of the movement. Barry Tuckwell's horn section are resplendent over timps that are admirably reined back for a change too: not for Britten the cannonade we are too often used to here which helps to keep the moment in proportion to the rest. The insistence on how every phrase must be "sung" doesn't ,though, mean everything is done against the service of the form in which it's set. Once again Britten manages a unique balance between detail and structure, erring this time on detail while just keeping track of the variation form Mahler employs. It's this latter aspect of the performance which means that, though the overall timing is 20:21, the movement seems to take less time. Britten leaves us wanting more, I suppose you could say, and this latter aspect seems to be the explanation behind why I felt the last movement seemed such a more natural than usual conclusion to the symphony. Sometimes the final song can sound as though it's been tacked on to the work and so emerge as an afterthought. Under Britten, with his care for through-thinking, there is no question that he accepts Mahler's decision to end things like this and is able to make it sound a natural progression - as if all symphonies end thus. Again he is quite quick and pungent, with some sharp interruptions and is aided here by his lively soprano, Joan Carlyle, who I rather liked. To me there's a "Tomboy" quality to her. Though I expect others might think she sounds too operatic. If she is then she's more of a Cherubino than a Susanna. I also enjoyed the down-swoops from the horns and the way Britten relates the bells in this last movement to those of the first giving a real sense of a full circle being completed. Don't expect the kind of ending you get with Barbirolli, for example. A gentle drift into slumber is not in Britten's mind. He maintains his sharpness to the end but at least the restorers at the BBC have carefully edited out the applause of the audience to leave us in repose. This recording of Mahler's Fourth surely has historic status alongside those by Hidemaro Konoye, Willem Mengelberg and Bruno Walter. Britten's presence as conductor alone demands it. But more than that I think it deserves to be compared with recordings by Szell, Maazel, Reiner, Kletzki, Horenstein, and one or two others, for general recommendation - a classic as well as a historic recording. I've no doubt this is a recording which deserves to be on every Mahlerian's shelf, irrespective of the fact that this is one great composer's view of another. Its care for neo-classical structure and, at times, bracing energy that can also accommodate a large amount of observed, sometimes newly-minted, detail and, in the remarkable slow movement, ample nobility, make it special. In future I might reach for it first. And there's more. I can think of just two other single disc recordings of the Fourth with couplings ? The Wayfarer Songs are from the Aldeburgh Festival of 1972 and match Anna Reynolds with Britten and The English Chamber Orchestra in the Snape Maltings. This is another great interpretation in beautifully balanced sound (the best sound of the three items) good enough to stand alongside those by Fischer-Dieskau with Furtwangler and Janet Baker with Barbirolli. Britten's use of a smaller orchestra means we are treated to some lovely detailing and allowed to enjoy his remarkable insight into songs he had admired all his life. Note, for example, the conclusion to the third song where Britten seems to find pre-echo of the disintegration at the end of the Fifth Symphony's second movement, and then the wonderful sense of funeral tread he brings to the fourth song: more Fifth than First Symphony, and deeply moving for that. Anna Reynolds seems intimate with the text and you can ask no more than that. The final couplings are two Wunderhorn songs with Elly Ameling from the 1969 festival and recorded in Blythburgh Church owing to the fact that the Maltings had been gutted by fire a few weeks before. We can hear again Britten's high regard for Mahler in the care he lavishes on these two jewels from the master's workshop, one of which, "Wer hat dies Liedlein erdacht", he had heard Elisabeth Schumann sing in London in 1932, two years before he had heard her in the last movement of the Fourth Symphony in Vienna under Mengelberg. Elly Ameling has just the right kind of perky voice for these songs which makes her account of the grim "Das irdische Leben" that much more chilling. Buried treasure from the archives and a great Mahler conductor restored to us, then.